Andros Outdoor Adventures was launched in 2011 with a mission to provide a sustainable, nature-based tourism service on the island of Andros. Andros Outdoor Adventures promotes low-impact nature based activities that conserve natural resources while providing relaxation and enjoyment to our clients. In Andros, you can explore all the natural resources of The Bahamas; such as coral reefs, white sandy beaches, rocky shorelines, extensive mangrove creeks and big pine forests. Captain Shawn Leadon proudly continues the legacy established by his father Captain Rupert Leadon over 30 years ago. 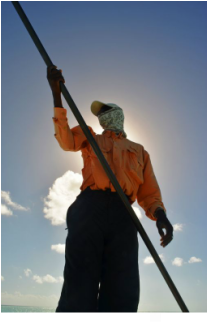 Captain Rupert Leadon (1945 – 2012) was an internationally known bonefish guide who was instrumental in establishing the flyfishing industry not only in Andros but throughout The Bahamas. Since his youth Shawn worked along with his father guiding and learning the coastal environment of Andros. They along with others, determined and implemented Catch & Release practices which has supported the sustainability of the industry. Over the last 10 years he has become focused on sustainable tourism and environmental conservation efforts. The establishment of Andros Outdoor Adventures is the culmination of vision to enhance and expand the fly-fishing experience; passion for experiencing the natural environment and commitment to the sustainable use of the natural resources of Andros.